When driving through a great expanse of desert in the middle of summer, the last thing you want to do is stop. Venturing out of air conditioning range is unthinkable. 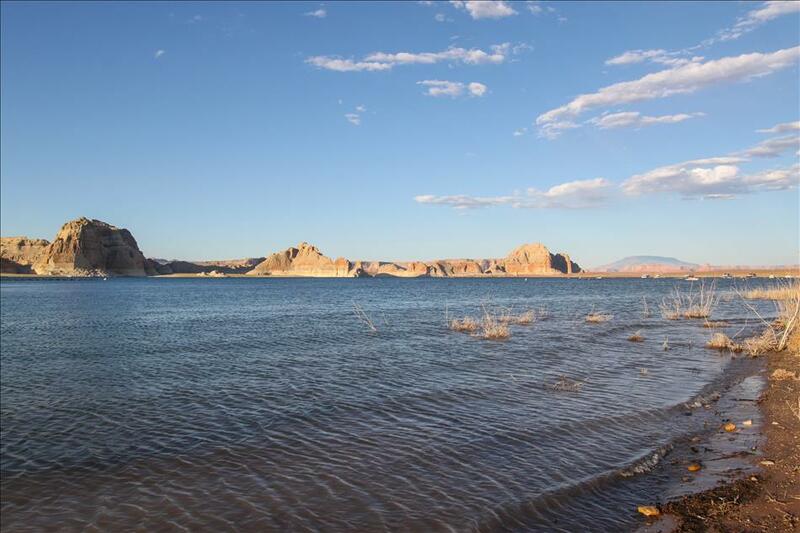 But in the case of Lake Powell, a little sacrifice yields a lot of reward. Smack dab in the middle of seemingly barren red sand desert is the last place you’d expect to find sparkling emerald green water. 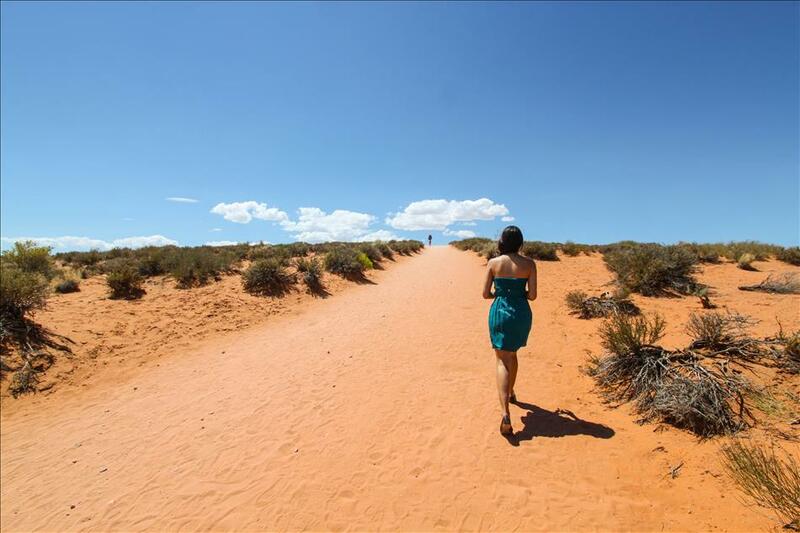 Lake Powell straddles the border between Utah and Arizona and is well worth a visit to its scenic desert rock formations cut by the Colorado River. 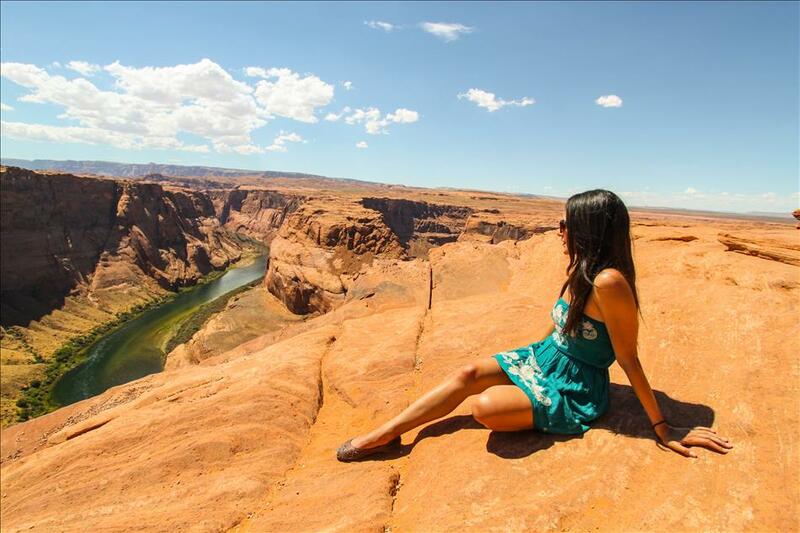 Horseshoe Bend is the one thing you absolutely have to see even if you’re just stopping through. It’s a spot where the Colorado River winds back on itself around a canyon of red rock forming a horseshoe shape. It can best be viewed from the canyon cliffs above which are accessible by a sandy 1.25 mile walk to the viewpoint. We went in the middle of the day, so it was scorching to describe it mildly. 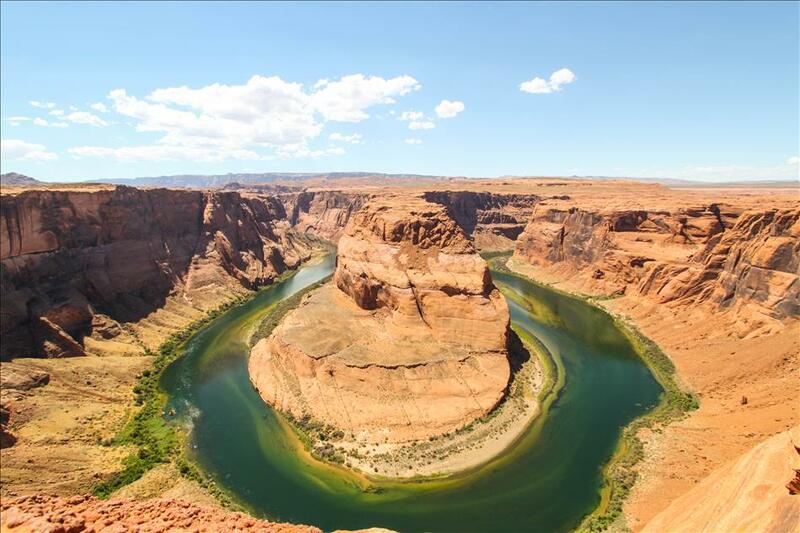 Sand was leaking into my leather flats burning my feet, as I trudged along not sure what to expect from a land mark with the name “Horseshoe Bend,” it doesn’t exactly convey grandeur in the blatant way “Grand Canyon” does. Despite the humble name, it was breathtaking, the colors, the formation, being so high up, everything about it was so naturally spectacular. There are no guard rails, so I was a little terrified the whole time I was on this rock ledge inching myself towards the remaining 3 feet to the edge, trying to get a good view. I ended up holding my breath, tiptoeing the closest to the edge that fear would let me, and snapping a photo. Lake Powell was where we’d be camping for the night. 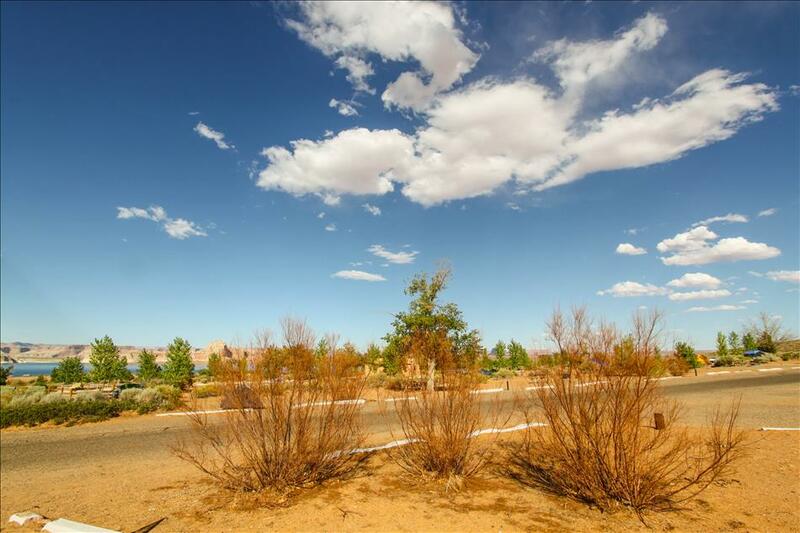 The campsite was a small patch of red sand enclosed in some desert brush and was frequented by jackrabbits seeking shade. 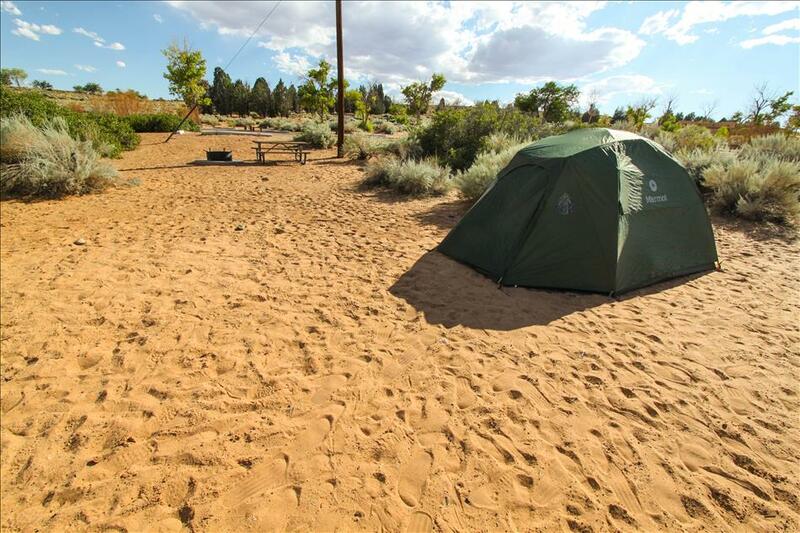 If you’ve ever wanted to feel like John Wayne kicking your cowboy boots around in the desert of the old west and pitching a tent in the sand, here is the place to camp. The campsite also gives you free access to the pool, shower, and gym facilities of their resort, so I slipped on my bikini and spent the day at the pool. Sunset was spent on the shore of the lake watching the sun ignite the red rock on the other side of Lake Powell. Concluding a short and surprisingly pleasant stop in the middle of the desert.